The health and developmental benefits of an exclusive own mother’s milk diet make it an invaluable area of investment in infant health. By optimising the milk expression process when breastfeeding is impaired or not possible, the PersonalFit™ PLUS pump set for Symphony® plays an important part in ensuring infants can still receive the benefits of this diet. An OMM diet is crucial for an infant’s neurodevelopment. Infants born at 32 weeks still have to develop at least a further 35% of brain volume to reach the capacity of a term infant.⁶ This means they need to catch up rapidly in the postnatal period. The first few hours, days and weeks after birth are a golden opportunity to initiate and build milk production. If this does not happen because breastfeeding is impaired, it is likely to be difficult for the mother to compensate for the resulting shortfall in milk volume. The benefits of an exclusive human milk diet last much longer than the infant’s hospital or NICU stay, which is why it is important to ensure mothers are building an adequate supply for life at home with their babies. While everyone benefits from more human milk being available, it is healthcare professionals who have the opportunity to really make a difference to infants by supporting mothers to provide an exclusive human milk diet. PersonalFit™ PLUS helps make this not only possible, but easier and more efficient. Medela offers a portfolio of comprehensive, evidence-based feeding development solutions for neonatal intensive care. 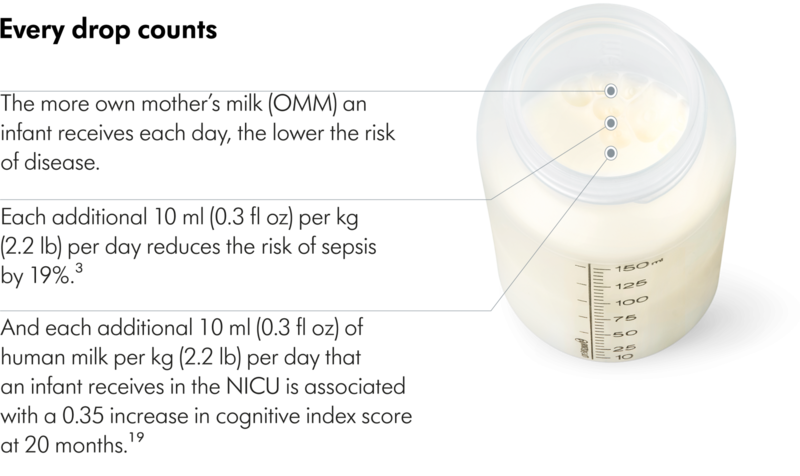 The aim is to provide milk to hospitalised infants in ways that are as close to breastfeeding as possible, in a manner that supports each individual’s feeding ability and maturation.